Happy New Years from doghouseplans.com! We are proud to share our extensive knowledge about our dog houses. We offer 40 years of being in business building dog houses, and it is our belief that we have come up with the best possible designed dog houses. These dog houses have been tested and proven. You can see from our customer pages the hundreds of photos from happy customers who have built their cutom dog houses using our insulated dog house plans. Many first time builders have accomplished building their dog a beautiful insulated dog house using our easy to follow step by step instructions. 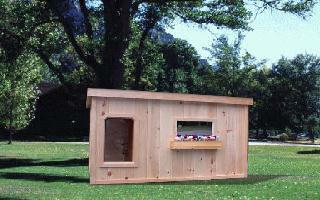 You do not have to be an experienced builder to build one of our law enforcement dog houses. These law enforcement dog house plans were originally designed to house Labrador Retrievers and German Shepherds which were the dogs that were primarily used in many of the various law enforcement agencies. 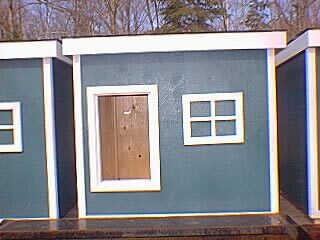 However, due to the high demand for excellent insulated dog house plans we have made our dog house plans with our material list, step by step instructions, blueprints, and optional outside kennel attachment, available to the general public so that you to can have a sturdy, durable, tested and proven designed dog house for your dog or dogs. At dog house plans.com we are happy to hear from you. Our phone number, email address, and location are easily accessible here and also throughout our website. This is our way of showing you that we stand behind what we sell. If you have any questions or concerns before you order; such as knowing the proper size house for your dog or dogs, or perhaps you need custom dog house plans due to special circumstances, just send us an email. We answer emails frequently throughout the day. 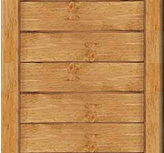 Currently we have over 55 sets of plans at dog house plans.com. 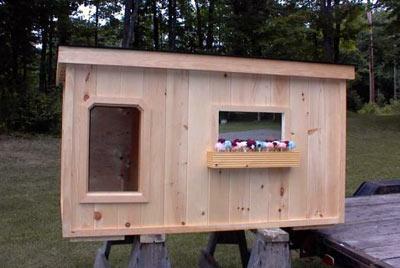 We have large dog house plans, small dog house plans, multiple dog dog house plans and they are all DIY dog house plans. Once your have purchased your plans we are always available by email or phone to answer any of your concerns. We don't expect you to download your plans and then you never hear from us again. We welcome your questions and concerns. Customer service is very important to us, and we are here for you. 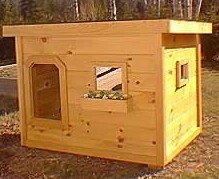 We want you to have the best dog house available for your dog or dogs. You will be so proud of what you have accomplished in building one of our dog houses, and we offer a customer page full of pictures as proof of our very many happy dogs with their new homes. 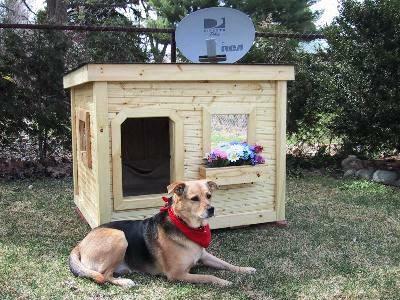 is pleased to present "Molly" from Michigan with her new dog house! 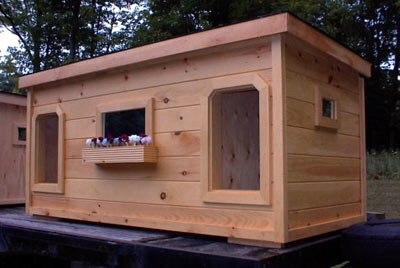 Use our easy to follow dog house plans to build a tested and proven house! 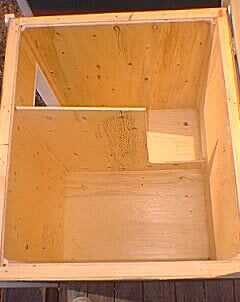 To see more beautiful customer completed dog houses click here. These dog houses have been built for the Ontario Provincial Police, State Police, numerous city Police Departments, Ministry of Natural Resources, Ontario Fire Marshall's, Customs and Immigration, and many private security companies along with numerous caring individuals. Our insulated dog house plans are in very high demand by these various agencies as they require the durability and quality of the best dog house. The 2 dog/1 door insulated dog house plans are designed primarily for two dogs that love to be together. These plans allow your dogs to sleep together in one sleeping area of the house. If your dogs do not get along, you need the 2 dog/2 door plans below. Some of these houses are used for dogs that are valued at over $25,000.00/ea. These dogs are used for such things as bomb detecting, drug searches, crown control, tracking, detecting human remains, detecting fish and wild game, and detecting arson fires. With this type of time and investment involved in these dogs, handlers wanted the best house available for their partner. There are many dog house building plans on the market today, but with our experience and years in designing and building, these dog house plans by far surpass the expectations of a unique doghouse. The 2 dog/2 door dog house plans are the most versatile plans available. These plans have two removable wind walls and one removable centre partition wall. This means that all walls can be removed from the dog house so your dogs will be able to be together, or be separated completely with each dog having their own space. These dog house plans are used primarily by owners whose dogs have disputes or don't want to share their sleeping quarters. In some cases the disputes are not constant, so these plans are great. The centre wall can either be put in or left out as the need arises. The 3 dog/1 door dog house plans are designed for three dogs that get along. With these plans all three dogs have one sleeping area behind the removable wind wall in the cold weather, or the entire house when the weather is warmer and the wind wall is removed. Whether your dog is a working dog, or a member of your family, these are the best dog house plans you can find. The design features comfort in both the extreme cold, and hot weather. All these houses are very well built and structurally sound to give your pet the utmost comfort in any weather conditions. With our 35 years of experience and knowledge of dog houses we have compiled a list of things to for you to look at before you purchase any dog house plans. 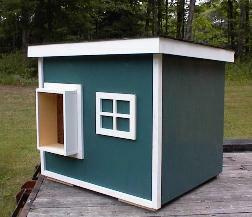 This list will help you decide where you should purchase your dog house plans. We call it our “Dog House Plans Buyer Beware List” and hope this will give you some of the knowledge we have acquired over the years. To see more customer testimonials for our wonderful law enforcement dog houses, click here. GIVE YOUR PET THE COMFORT IT DESERVES TODAY!